I have just submitted a complaint to Translink. This being a Sunday afternoon there is apparently no-one available to answer the phone so I used an online form. The #22 was following a #2 which had stopped and was occupying the stop. The operator of the #22 chose to overtake the #2 and did not check to see if there were any passengers waiting at the stop for service beyond 16th Avenue. The operator of the #2 made no attempt to contact control to report the incident. Another off duty operator on that bus suggested we telephone Translink. There is, of course, no-one to answer the phone on Sundays. Passengers complain all the time about pass-ups due to full buses. Both buses in this case were lightly loaded. From casual observation it is not at all unusual for a #2 and #22 to proceed in convoy. The #2 is simply a short working of the #22 – a long route from the Dunbar loop on the west side to the Knight Street bridge on the east side. The #2 simply covers the section between Burrard Station and 16th Avenue. Bus operators are supposed to provide a service to the public. In this case the operator was simply concerned to get to the end of the line as fast as possible. Operators of buses have many complaints about passengers too of course. And they take the brunt of the anger directed at Translink for matters well beyond their control. They take verbal and physical abuse. But they also follow their own code which has much more to do with making their job easier than the convenience of the travelling public. Bunching outside of peak periods, overtaking and deciding to pass up passengers should not occur but are, I suspect, not infrequent occurrences. I have absolutely no expectation at all that any attempt will be made to either identify the operator or even record the incident. CMBC are now investigating but warn me that I am not allowed to share whatever they find out. Well, I know what happened – and so do the people who were there. And now so do you. You just cannot know if anything is done about it. Experiences like this one are one of the many reasons why “choice” passengers – those who have an alternative – avoid transit when they can. 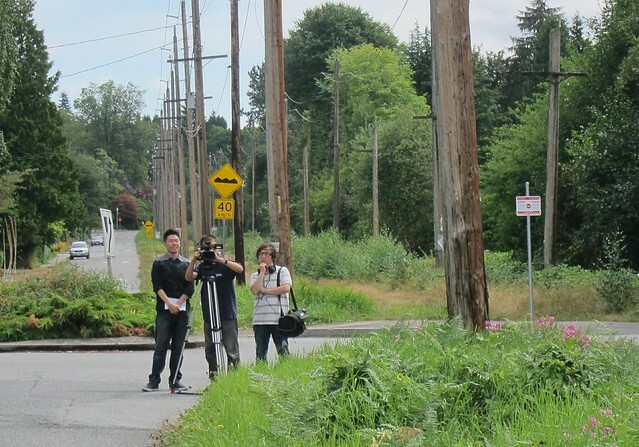 CP has started ripping out community gardens in Marpole along the Arbutus corridor. I helped Fairchild TV make a documentary about this episode this afternoon. Quite why CP thinks the City of Vancouver is more likely hand over even more taxpayers’ money to them by holding hostages I am not certain. Kirk LaPointe of course would not be happy no matter no matter what decision the Mayor makes. He was on the CBC TV evening news blaming the Mayor for making a ridiculously low offer, forcing CP’s response. No doubt had the Mayor made a much bigger offer that would have been derided as overly generous. The sad truth of the situation is that the incumbent cannot please the opposition. Maybe voters in general will appreciate a Mayor who stands his ground against a bully even if gardens are destroyed. CP has the hammer and they don’t have to run a single train to get their price for the land. To run trains they need to upgrade the tracks. They need to upgrade the level crossings. Imagine you are trying to drive down Broadway and Arbutus at 8:30 am and the traffic is gridlocked. The cause? CP is doing work at the crossing. That entails working in the signals, the track…The city can’t do a damn thing. CP has the right to maintain their tracks, equipment, level crossings at any time without restraint. CP has the right to run their trains 24/7. CP has the upper hand. Working in a garden and eating fresh fruit and vegetables are a very good ways to improve your heart health. Try to do that, whenever possible, well away from the miasma of diesel exhaust. There is an article on VanCityBuzz on the lack of ability to expand the Canada Line which mentions a possible Arbutus Line at the very end. When I read it, much of the subject matter and approach seemed very familiar. I am not sure if that is reassuring or not. There’s a very entertaining piece on the Port Mann Bridge by Neil Salmond on Strong Towns. It is all about what people do when faced with a choice between a fast, tolled route and a slower, untolled route. Or rather, what they say they will do. Apparently in Ohio drivers said they would drive out of their way to avoid a toll. Which, of course, is exactly what they are doing here: driving over the Patullo instead of the Port Mann. Even though the extra cost in gas alone is often going to be about the same as the toll, as demonstrated by a neat little gizmo put together by Todd Littman and the Sun. There’s also the fact that traffic forecasts in general seem to have made a fundamental error by simply extrapolating from the past. Just like steering a ship by staring at the wake, this method has some fairly obvious shortcomings. When circumstances change, so should expectations. This blog has often berated transportation models – and modellers – for the shortcomings of the standard models. This particular issue is one that is often key to making decisions about choices for the future. How do you assess the willingness of people to choose a new route or mode which is currently not available? Two methods are in use: Revealed Preference (RP) and Stated Preference (SP). The first one, RP, makes some generalizations about trip behaviour as a combination of time and money known as “generalized cost”. Data is collected about trip making and this is examined in terms of the trips made and the way they get distributed between routes and modes. This gets quite sophisticated as we know that travel time is not valued by users the same way in different modes. People prefer to be moving rather than waiting, and prefer to be seated and in vehicles under most sets of circumstances. So the values ascribed to time are different: people who are stuck in traffic or waiting for a bus are conscious of wasting time. People riding comfortably as passengers on public transport can use that time to do other things – read, use their cell phones and so on. With enough data about trip making on different routes and modes, it is possible to extrapolate what the new route/mode will be worth to its users in terms of time savings or greater comfort and convenience. It’s not hard, for instance, to compare High Speed Trains to airlines for city pairs and come up with a general rule that shows the threshold at which one will be preferred over the other. RP is only reliable for as long as the values assigned to the parameters do not change between the time the data was collected and the new project opens. SP uses consumer surveys to get people to consider alternatives and tell the surveyor which one they prefer. It is widely used for all kinds of decision making – the appeal of new products and services, or even political preferences. And again it can get quite sophisticated in getting people to make comparisons and choices which are largely conjectures based on synthetic alternatives. And has a varied track record in accuracy of forecasting what choices get made in the real situations. In a region where there were no road tolls, it is quite surprising to me that the reported response to tolls for a bridge in Ohio were so negative. When people who used the free Albion Ferry were asked if they would be willing to pay a toll for a bridge, they said yes. And given the multiple sailing waits experienced at peak periods, the value they put on their time could also be measured in terms of the length of the trips they would otherwise have to make – crossing the old, congested Port Mann or the much more remote Mission Bridge. In any SP survey, people want to impress the surveyor with their rationality and decision making ability. In good ones, this well known issue is taken into account. The traffic forecasts for the new Golden Ears Bridge were wildly optimistic. Traffic has so far failed to meet the expectations of the bridge builder/operator. A similar mistake was made with the Port Mann. And this being BC where we design P3 projects to shift money from the pockets of the public to private sector companies, we now pay through taxes for these errors. The bridge builder/operator faces no revenue risk. In the case of the Port Mann there was already a good reason to doubt the traffic forecast. There was no bus service over the old bridge. It would have been easy to provide one, that would avoid the congestion of the bridge approaches by using bus lanes on the shoulders of the freeway. The 555 could have been running years ago – but that was avoided as it would have reduced the perceived “need” for freeway widening. And actually much potential new transit traffic could also have been won by running a direct bus between Surrey and Coquitlam instead of relying on an inconvenient, out of the way combination of existing SkyTrain and bus routes. There has been a secular change in perceptions of the value of time and willingness to pay tolls that has not been taken into account by the forecasters. And that is that real personal incomes have been stagnant or declining for a long period of time. Moreover, the expectation that things will get better in the future – which seemed common for most of the post war period – has evaporated. Tax cuts have benefitted the wealthy disproportionately, since they have been replaced by all sorts of fees and charges which are levelled instead: they are applied with little or no consideration of ability to pay. The toll across the Port Mann Bridge is the same for the office cleaner and the CEO. The other thing that has to be noted is the reliability of the data that is being collected. I have observed many times how this region collects far less travel data in terms of sample size than other cities: and this is orders of magnitude difference. But some of the most reliable data on trip making came from the census – at least for the journey to work mode choice over a very long time scale.